PRO AQUA is the environmental work made by me and my colleague Helena Perkiö. We were attending the Näkymä 2003 Environmental Art Exhibition in Toijala Nahkialanjärvi last summer during July 5 - August 31. This exhibition was organized by Toijala Art Association, City of Toijala and City Center Developing Accossiation of Toijala. The benefactor of the exhibition was the culture minister Tanja Karpela and the artistic director was nationwide artist of Pirkanmaa, Jaakko Himanen. The Pirkanmaa Art Commission is supporting this exhibition. All the works of over 20 artists were located at the environment of the Lake Nahkialanjärvi during 5 July - August 2003. How important this "transparent gold" is at the moment and in the future, can be seen on the newspapers, which are constantly writing about the shortage of the dringking water in our globe. These little lakes in our PRO AQUA installation are symbolizing those thousands lakes in Finland and also every other lake in the world, which hopefully never meet the cementation and can satisfy our basic needs throughout milleniums on this planet.PRO AQUA is the environmental work made by me and my colleague Helena Perkiö. We were attending the Näkymä 2003 Environmental Art Exhibition in Toijala Nahkialanjärvi last summer during July 5 - August 31. This exhibition was organized by Toijala Art Association, City of Toijala and City Center Developing Accossiation of Toijala. The benefactor of the exhibition was the culture minister Tanja Karpela and the artistic director was nationwide artist of Pirkanmaa, Jaakko Himanen. The Pirkanmaa Art Commission is supporting this exhibition. 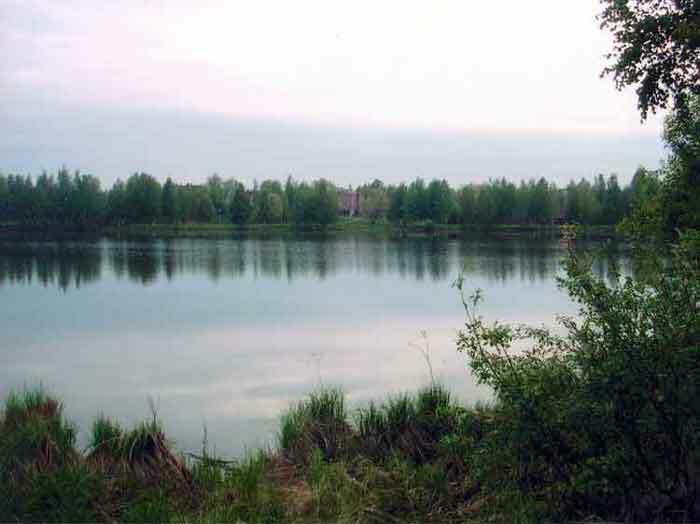 All the works of over 20 artists were located at the environment of the Lake Nahkialanjärvi during 5 July - August 2003.